Ethics is defined as the science of the ideal human character and behavior in situations where distinction must be made between right and wrong, duty must be followed, and good interpersonal relations maintained. Each profession has its own ethical standards, which members of the profession are expected and required to follow. Dental ethics refers to the moral obligation of the dentist toward his patient, professional colleague, and society at large. There are six principles which govern ethical practices be it in the dental clinic and/or dental research. There are different fields where ethics plays an important role: Bioethics, business ethics, animal ethics, political ethics, legal ethics, military ethics, public sector ethics, and publication ethics. Bioethics is the study of the ethical issues emerging from advances in biology and medicine. Documents, such as the Declaration of Helsinki, ICMR Guidelines 2017, ICH GCP, CIOMS Ethics Guidelines, and CDSCO GCP, enunciate the principles of ethics for research on human subjects. In 1975, at the first revision of the Declaration of Helsinki at Tokyo, the members of the World Medical Association introduced the concept of an ethics committee (EC). This committee is now an internationally recognized mechanism for ensuring that guidelines are followed, and the principles of ethics are upheld. Over that last 40 years, the EC has been recognized as the strongest protector of subjects' interests. In most countries, the ECs responsibility and role has grown exponentially, taking over many responsibilities of the regulators. According to the National Ethical Guidelines for Biomedical and Health Research Involving Human Participants (2017) all research involving human participants should be conducted in accordance with basic and general ethical principles. The researcher and the team are responsible for protecting the dignity, rights, safety, and well-being of the participants enrolled in the study. The researcher should have the appropriate qualifications and competence in research methodology and should be aware of and comply with the scientific, medical, ethical, legal, and social requirements of the research proposal. The EC is responsible for ensuring that the research proposal conforms to the above requirements and that the research is conducted in accordance with the aforementioned principles. Medicine is a multidisciplinary science that has advanced so much that super-specialization is the rule and not an exception. It is a dynamic branch which deals with the disease and health of people. Continual research, development, and innovation are the need of the hour. With constant research in each discipline, there are its unique opportunities and challenges, especially when the general principles of ethics are to be applied. All research is divided into two general classes, as nontherapeutic and therapeutic (sometimes the classification of basic and applied research is used). In general, nontherapeutic or basic research delves deep into physiology and pathology attempting to understand the basic mechanisms of disease. Therapeutic research is based on advances made in nontherapeutic research and is more concerned with introducing newer medicines or other treatments for better control over disease. Regulators all over the world focus mostly on therapeutic research usually sponsored by drug developing companies or organizations. Nontherapeutic research more often than not is outside the purview of Drug Administration and is loosely controlled by bodies such as the Indian Council of Medical Research. This type of research has relatively lower funding and is often done at academic institutions. It must also be mentioned that a large part of nontherapeutic research is descriptive and observational, with low potential to harm human subjects. For smooth conduct of such research, ECs should be aware of the risks and burdens which such studies put on subjects and modify the approval process accordingly. 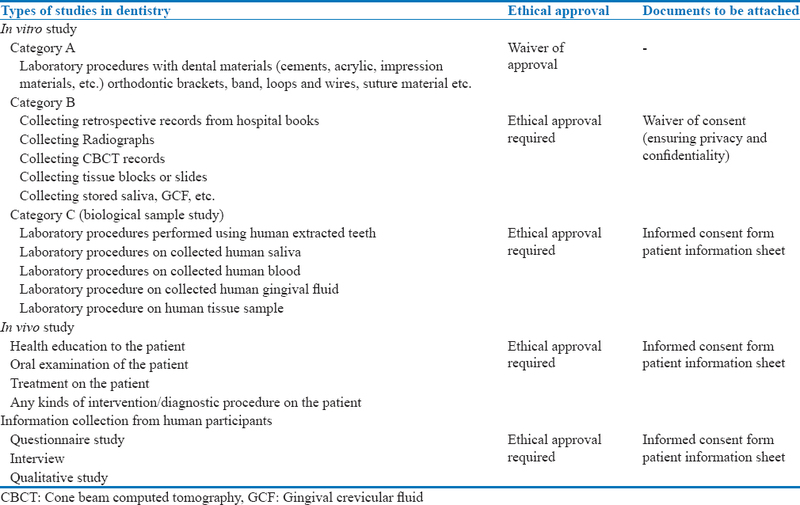 Contents of [Table 1] enlist the different type of dental research studies, the kind of ethical approval needed and the documents to be attached along with the research proposal. Category C: Here, the researcher collects samples from the human participants for the study such as samples of tissue, blood, tooth, saliva, and GCF for research purpose where the procedures will be conducted in the laboratory. As such, no investigative or interventional procedures are done on the patient, but only samples are obtained from the human participants. Here, an ethical clearance is required, and the researcher will have to attach a patient information sheet and informed consent form along with the research proposal. Here, the researcher is collecting information from the human participants such as interview, questionnaire filling, and conducting qualitative study (focus group discussions, in-depth interviews). The researcher will have to attach a patient information sheet and Informed consent form along with the research proposal. Privacy and confidentiality have to be maintained. This article intends to provide the basic know-how about ethical permissions to be taken before starting a research study. This will definitely help the new budding researchers who, many a times are not aware about which study needs an ethical clearance and what documents need to be attached for presentation before the EC. Available from: https://www.iitm.ac.in/downloads/ICMR_Ethical_Guidelines_2017.pdf. [Last accessed on 2018 Oct 11].